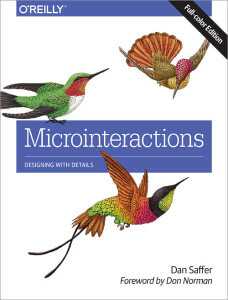 Microinteractions sits somewhere between the purely theoretical and conceptual (The Psychology of Everyday Things) and the practical (cite any how-to-create-UX-artfacts book on the market today). It is a reinterpretation of concepts that have been around as long as, or longer than the UX field itself. “Atomic design,” or otherwise known as designing each complex interaction at the smallest level around which a user forms a cognitive model is a powerful thought, and one which the profession has done some serious soul searching in the past. That is because designing for microinteractions is diametrically opposed to the level of the parti (which we talked about in an earlier bookclub) and often the level at which we approach things. But specifically this post is about why this book should be required reading for everyone who touches software products from the highest level to the developers on the ground: simply the details have an incredibly pronounced effect on the final experience, and it is precisely many of these details which often get tweaked, glossed over, re-done (or even done a first time!) by folks who are not as close to the user experience. How often I’ve seen the microcopy left to the very end. Too small to be written by your content experts, and so trivial (perceived!) as to be tweaked after the initial UX work. I’d say that I’ve learned that maintaining the integrity of this facet of a product is among the most difficult to see through the development process intact. You occasionally see additions of instructional text in blocks of descriptive text (page 101). Another challenge of this small aspect is that it forces our content writers to think like UX designers do. When we imbue a button of a certain style with a contextual meaning, we do so with intentionality; but often a content writer uses the word because it means what it does. Considering the word decoupled from its linguistic context and looking at it as an object with an internal context can be challenging and unfamiliar. Consider the word as if a button style and it can create a powerful linguistic connection with your product, that compliments the rest of your design. Example: Facebook and the word “like” (page 100), or even the verb “friend” (though perhaps MySpace of Friendster deserve credit for that one’s ubiquity). Next time we’ll talk about the salient lessons for UX practitioners. Because although we know not to ignore the details, Microinteractions reminds us of a few details which are sometimes a bit more below the radar. We’re continuing to read through Frederick’s handy reference guide for architects and designers in general. What exactly is experience? And what is it about something which is so universal, that seems so opaque most. Everyone has emotional reactions to things: whether television programs, electronic devices, meals ordered at restaurants. Somehow it seems kind of elusive for most to imagine that there is someone behind the scenes in all of these cases thinking about what they’re doing and how it may bring out a certain feeling in the person experiencing it. Is it because we couch our language in that of psychology? At work many are comfortable with the notion that we’re using psychology to gain insight into what people do and how we can do it better; however, when that same thought is applied to the more quotidian interactions in one’s day, is there a resistance? Has the power of psychology become so mired by the valid critiques of Freud’s psychoanalysis and the subliminal advertising schemes of the unscrupulous (and very few!)? Or do we only see it as a modern-day practice which occurs behind closed doors replete with couches and notebooks? How I think I sound when I attempt to explain what I do for a living to people who have never worked in the tech field. I tend to begin explaining what I do by referencing industrial design, and in particular mimic the strategy used in the first chapter of Donald Norman’s The Design of Everyday Things. I often begin with the teapot metaphor. With so few affordances, it continues to this day to be a classic example, and easily grasped by anyone over the age of three. How many other objects have preschool sing-alongs that clearly enumerate the affordances, forcing mechanisms, constraints, error prevention, and user feedback systems endemic to good design? How many other objects have preschool sing-alongs that clearly enumerate the affordances, forcing mechanisms, constraints, error prevention, and user feedback systems endemic to good design? By relying on industrial design metaphor for user experience design, some of the complexity and accuracy in what I do is lost. Sure, some of my great aunts might think that I design teapots. But conceptually? I’d rather have them understand the concept than to know how to jump in on the next project and know where to help me out next. The first book in our UX Bookclub series is a personal favorite, and one which is dear to my heart. 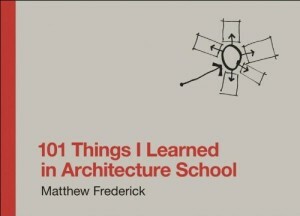 Matthew Frederick’s 101 Things I Learned in Architecture School, should be a classic in any user experience curriculum. Firstly, my interest in user experience and design as formulated in my time studying as an Urban Planner. Often, I find myself [at job interviews in particular], being asked to justify my non-traditional educational background for my career path. This book sums it up fairly nicely in my opinion. On page 40, Frederick suggests that good designs should have a “Parti pris” or a central idea/concept: UX practitioners, particularly when wearing their interaction and visual design hats can benefit from keeping this in mind. When drawing a wireframe, it is worth stepping back to ask “what does it all mean” or “what is it all leading to.” Architects know that symbolic design, can invoke certain feelings or sentiments, even at a subconscious level. Is there a conflict? You may not be able to point to it at first glance, but it can be felt. When we design something on the page, can the sum of the parts be greater than meeting a list of requirements? Sure there’s your navigation, your main content, your advertising space, but without a parti, have you really designed something? I find that having an overall idea is helpful for beginning to think of how simplicity can create legibilities out of complexity. The diagrams on page 101 are certainly an architectural base, but what UX designer hasn’t sketched nearly the same thing in trying to understand a product? And of course, as important as the big idea is: You should never become too attached to it (page 68). 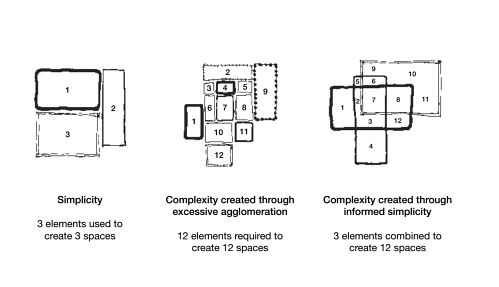 Approaches to Complexity via informed Simplicity. Another remark which rang true was the quote about architects and engineers. 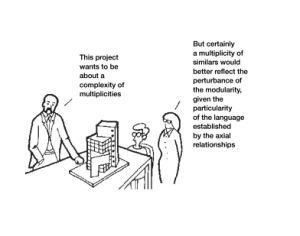 Though the current move towards UX specialization in the field might reflect a change away from this, this notion of “An architect knows something about everything. An Engineer knows everything about one thing” (page 52) still feels true. In the world of UX, we must work with front-end developers, back-end developers, business and account folks, in addition to project managers. We are uniquely positioned in that to do our job well, we must know enough to negotiate and understand others’ perspectives [and know enough to know what we don’t know]. This in general is a succinct description of the philosophy I try to embody in my practice. We often end up like architects do, mired in the details about product (page 68). But without taking the time to think about the big picture, and the why we think about the picture, we risk losing our parti, losing our users, and losing what we bring to the craft of creating great products and experiences. This view at 40,000 feet that might be uncomfortable for some. Either you’re afraid of heights, or its that the view from height forces one to “[accept] the anxiety that comes from not knowing what to do” (page 68) from seeing the big picture. To realize the chaos and complexity that we’re trying to understand. These things may not always be able to be reigned in, or made simple. But understanding how we’re imposing simplicity, and what lens we are bringing to the process helps us to clarify our perspective. This in turns helps us to better articulate the value hypothesis, and test it with our users.